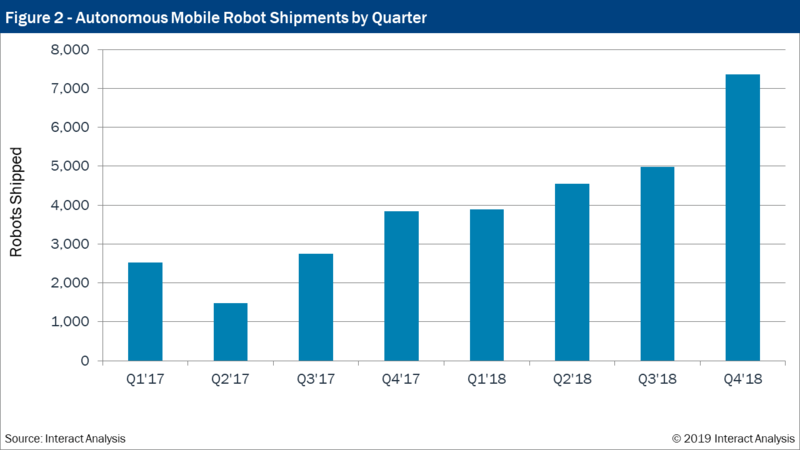 The results of our freshly released quarterly mobile robot market tracker show that AMR demand continued to surge in Q4, and that more than 20,000 AMRs were shipped in 2018 – double the number sold the year before. All regions (Americas, EMEA, APAC) saw tremendous growth, however APAC, and China in particular was the largest driver of the volume growth. Whilst we’re still considering the results for 2018 as ‘preliminary’ (until we conduct the full analysis as part of the 2019 edition of our annual Mobile Robot Market report), it does seem certain that shipments surpassed the 20,000 milestone, and that AMR revenues grew by around 80% year-on-year. A much more thorough analysis on the industry is being conducted currently by our analyst team and we’ll report back in due course on the findings. Although the industry saw explosive demand for AMRs in 2018, the fortunes for AGV vendors was much more mixed. The report showed that AGV revenues (still the largest chunk of the market) grew at a much more somber pace of around 10%, and the data indicated that the Americas AGV market actually dipped slightly year-over-year (see figure 1). Whilst staggeringly high, 20,000 AMR shipments is in line with our forecast released early last year (we predicted 19,738 to be precise), and so this seems to support our longer term forecast of 350,000 AMRs being shipped between 2018 and 2022. To be clear these numbers only include AMRs sold to 3rd parties, not those for example made by Amazon for use in their own warehouses. And whilst 350,000 units installed in 5 years may seem optimistic, we should also point out that we understand that Amazon alone already has more than 200,000 robots installed and in use right now. Combining AGVs and AMRs together, it was deck-load products that drove the largest increase in revenues and shipments, accounting for half of all revenues and close to 80% of total shipments. Small, lower cost conveying vehicles appeared to see particularly strong demand, but also larger platforms designed for carrying pallet-loads were also in high demand and achieved impressive growth. Aside from those, our results indicated continued and growing demand for forklift/pallet truck robots, with shipments growing by close to 50% according to the preliminary results. 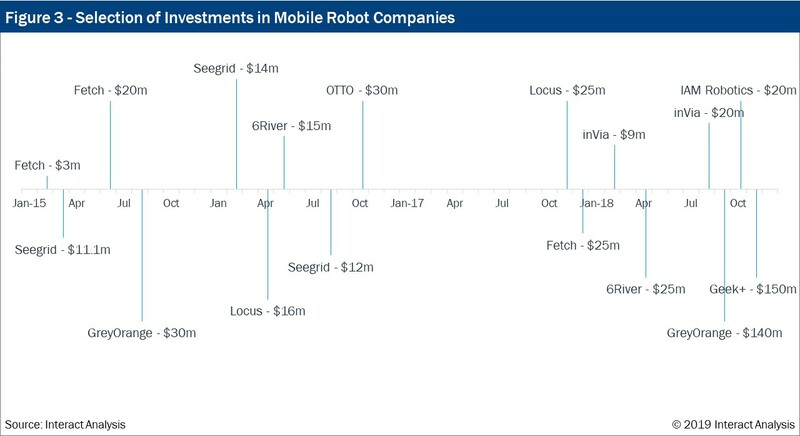 Amidst a backdrop of exploding sales and shipments, 2018 proved to be a record year for investment into mobile robot companies. More than $360m was invested in mobile robot companies focused on the logistics sector, compared to just $50m the prior year. When you consider the pace of growth of the companies involved, the underlying macro-drivers of growth coming from warehouses and fulfilment centers, as well as the increasing acceptance of the technology; it is easy to see why investment dollars are flowing in. Two of the biggest investments of 2018 came towards the end of the year and were both directed at APAC companies – GreyOrange and Geek+, who focus on similar technology to Kiva (Amazon’s in-house robots). Whilst not necessarily a new approach, the fact that Amazon has hundreds of thousands of similar robots in its own warehouses, and because both GreyOrange and Geek+ have successfully commissioned major deployments with their robots, makes investments in the companies as relatively safe bets. Interestingly, both of these companies have sought to diversify recently into new applications, in particular parcel sortation robots which could prove a lucrative niche. Given the dramatic pace of industry growth, and because there’s massive variation in growth by product type, market segment and vertical; it is perhaps not surprising that we’ve seen the rankings of leading vendors change considerably in 2018. In 2017, we ranked Dematic as the #1 supplier (having undertaken bottom up surveying of around 70 leading players). Back in 2017, Dematic (including other KION brands) had a considerable lead over its peers; however, the picture for 2018 is less clear. Many vendors have tracked industry growth and seen their business double in 2018 – some even more. As such the rankings for 2018 could look quite different. Whilst we’re not yet in a position to announce our rankings for 2018 – we need to complete our full bottom up assessment over the coming weeks – it looks quite possible that we have a new market leader.